Recently we took on Friends of Dance as our newest "Giving Back" project. This non-profit organization is part of the University of Mary Washington (UMW) Foundation and its expressed goal is to "support, encourage, and promote the art of dance" at UMW. We offered to help the Friends of Dance reach a new generation of supporters by increasing its online presence and helping it generate email campaigns. In the past, all Friends Of Dance information was communicated via expensive snail mail from a somewhat outdated list of addresses in a spreadsheet. Then we went to work and set up an email marketing tool that will grow and maintain lists automatically. Now, for FREE, they can inform people of upcoming events, tell their dancers' stories and let folks know how their donations are being utilized to fulfill the mission of supporting dance at UMW. The email campaign points people to their website for more information, but ye olde site was dated and maintained by a single volunteer. We created a brand new website and provided training that makes it easy for several authorized Friends of Dance volunteers to contribute photos, blog entries and more. We gave Friends of Dance a new identity which is helping build their visibility and reputation. Short term it has engendered renewed energy and focus among long time Friends of Dance supporters. Over the next five years the refreshed look, combined with the functionality of the website and the email campaigns, ought to result in increased donations and multiply the positive reputation that Friends of Dance enjoys in the Greater Fredericksburg community. 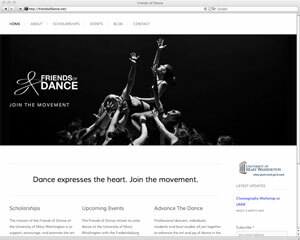 You can view the new logo and tagline at http://www.friendsofdance.net. If your business or non-profit is looking to build your brand and positively increase your reputation we can help. Contact us today to learn how our communication strategy, photography and graphic design skills help your organization achieve success.